We all dream of getting a windfall. For many, it remains a dream, but for some of us, life throws us a lucky break. Perhaps you won the lottery. Perhaps you got a settlement. Or perhaps you sold an old vase you found in your attic for millions on Etsy.com. Whatever it is, all of a sudden you’ve got loads of money and no idea what to do with it. Facing the dilemma of what to do with a large chunk of money is an envious one, but one that you must face bravely. 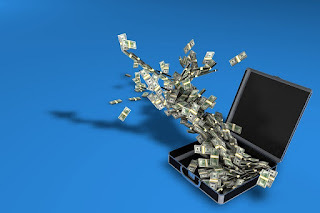 Here are some popular approaches to dealing with a sudden, massive wad of cash. Karen Altfest is the vice president of a financial planning firm based in New York City. Her advice for people who suddenly come into a lot of money is to use the 3-pocket approach. The three pocket method is exactly what it sounds like. Altfest says that people should put their money into three pockets. In the first pocket, they should put enough money to pay down anything that needs paying down. That might be a mortgage, auto debts or kids college fees. In the next pocket, she says that they should put the money they need to save for the future. For instance, money for your next car or retirement. In the third pocket, they should put any money leftover to spend on what they want. This could be for a holiday or something special that they’ve always wanted but could never afford, like a kitchen. David Jones is a member of the Association of Independent Consumer Credit Counseling Agencies. Over the years, he’s witnessed thousands of people fall foul of debt and get themselves into all sorts of problems, financial and otherwise. His advice for anybody who has received a windfall is to immediately squirrel some of it away - $10,000 at least, he says. The next step, he says, is to use the rest of it to pay down debts. Given that 47 percent of people are living paycheck to paycheck, most have outstanding debts that need to be cleared. Some people don’t have any debts. For these people, Jones suggests putting the extra cash into a money market fund. Money market funds are low risk, he says, and offer a balanced return across a range of assets. Settlements can win people a lot of money. Just visit https://www.ColoradoInjury.pro for more information. According to that site, they can easily top $8 million. Because that’s such a large amount of money, it’s often best to take things slowly at the beginning. Lynnette Cox, the author of Debt Zero: The Ultimate Guide to Financial Freedom, says that it’s best to take little baby steps. The first thing she advises people do is to find a financial advisor. Financial advisors can help people to do long term financial planning and get their finances in order. Next, she urges people to give themselves time to rest. Many people end up splurging on one investment or another without giving themselves time to think through whether that’s the best thing to do. It’s also important, she says, to make a plan for dealing with money requests. Sometimes it’s hard to say “no” but it's essential, if you don’t want to wind up supporting people forever. She says that a plan helps to create a buffer between you and your friends and family. Sometimes intermediaries who can respond to requests can help. Everybody has areas where they are financially weakest, according to Gail Cunningham, the chief spokeswoman for the National Foundation for Credit Counseling. And so when they receive a windfall, she says that they should focus on these areas first. One common financial weakness is the mortgage. Leading up to the financial crisis in 2008, many homeowners took out the biggest loans that they could. When the interest rate went up, they could no longer afford to pay the mortgage payments and the entire mortgage market went up in smoke. Many wound up foreclosing on their homes, simply because they hadn’t built up enough equity. Cunningham says that people need to use windfall money to bolster their finances in these situations. Overpaying the mortgage is an excellent way to avoid interest rate hikes in the future. When most people get a windfall, they want to spend it straight away. But that might not be the best strategy, according to Larry Winget, the author of The Idiot Factor. He says people should do three things when they come into a lot of money: save, save, save. It might sound like boring advice, but with the right investments, a big chunk of money can produce a handsome income for things like retirement. Once you’ve saved the money for your retirement, you never have to think about pensions again. What To Do If You’re Already Loaded? Even if you’re loaded, many experts recommend you save most of your windfall income. Wayne Bogosian, a man who writes books about saving for retirement, says that people should obey the 80/20 rule - save 80 percent, spend 20 percent. The cool thing about Bogosian’s rule is that there are no restrictions on how to spend the 20 percent. You can spend it how you like, he says. He does recommend, however, that people living in America aim to max out their IRAs and 410(k) plans because of the tax savings. What’s the most valuable thing you own? Besides your own body, it’s your house. Ron Phipps, the president of the National Association of Realtors, says that people who own their own property should reinvest some of their windfall money into doing them up. Investing in your home, he says, can help bolster its retail value and give you a much higher standard of living. Once you’ve finished with all the repairs and installing a new kitchen, he says people should spend the money on something that they’d really enjoy, like a spa.